Trying to lose weight? 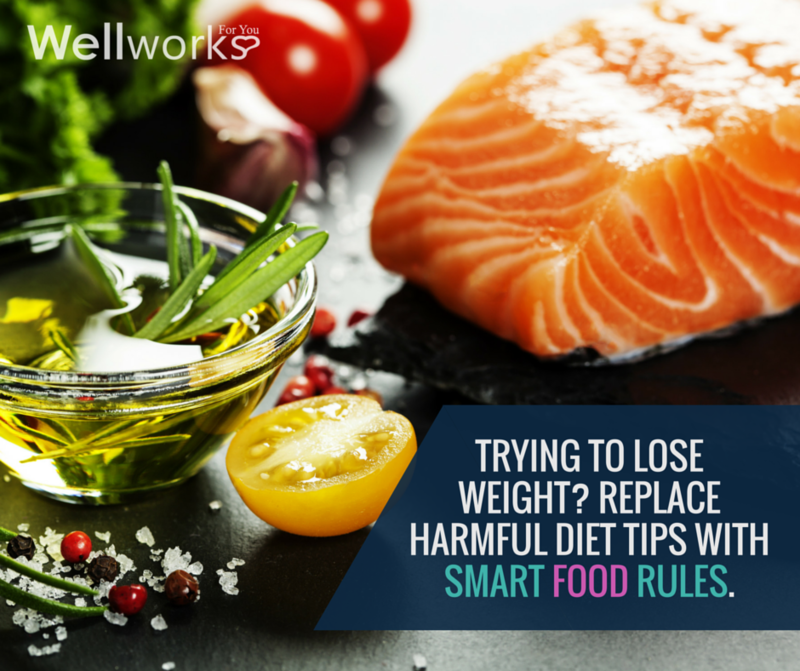 Replace harmful diet tips with smart food rules. When it comes to diet tips, losing weight, and “forbidden foods,” there’s as much advice out there as there are stars in the sky – but unlike the stars, these “tips” aren’t always the brightest. This is nothing new; crazy diet advice has been around for centuries. Arsenic pills and tapeworm diets are (thankfully) no longer in vogue, and we now know that cigarettes are not, in reality, an invaluable weight loss tool. However, there are still some popular nutrition tips for losing weight that can do more harm than good. All Calories Are Created Equal – Nope, not at all. A common misconception when making diet changes to lose weight is to assume that “a calorie is a calorie,” but nothing could be further from the truth. 50 (dense) calories of spinach is a far cry from 50 (empty) calories of french fries. The chemicals and byproducts found in processed foods can also affect your body’s absorption of the nutrients in them. Aim for packing your diet full of quality calories from whole foods. Avoid the Evil Egg – Eggs have gotten a bad rap, but many nutritionists actually consider them to be a perfect food. Egg whites provide protein, and the nutrient rich yolk is packed with carotenoids, essential fatty acids, and vitamins A, E, D, and K. When you choose pasture-raised eggs, not only are the laying hens treated better, but they lay eggs with double the amount of Vitamin E and Omega 3s than commercially raised hens! Stick With Sugar Substitutes – Switching to “diet” soda is a long-standing nutrition tip for losing weight, but it’s wrong. In fact, many studies are showing links between diet soda consumption and weight gain. Ouch. Daily diet soda drinkers are also at greater risk for metabolic syndrome and type 2 diabetes. Ditch soda altogether in favor of fruit-infused waters and unsweetened iced teas. Just Say “No” to Fat – Just as not all calories are created equal, you can’t lump all fats together in the “evil” folder either. While the fats in chips, cookies, and greasy, deep-fried foods are to be avoided, the “good fats” found in nuts, olive oil, avocados, and salmon are actually beneficial. Also, steer clear of “diet” foods bragging to be “fat-free,” as these are usually highly processed and pumped full of salt and sugar to replace the flavor lost when removing the fat. A Multi-Vitamin is All You Need – Or…you could eat a balanced diet full of nutrient-dense whole foods! Except for folic acid and Vitamin D, the vitamins and minerals found naturally in a healthy diet are far superior to those found in a pill. So when you’re trying to decide what to eat when losing weight, don’t replace healthy foods with a vitamin. It’s important to remember that weight loss is a marathon, not a sprint – and any “fad” diet promising rapid weight loss will likely do more harm to your body than good. The word “diet” comes from the Greek diatia, which describes a “whole way of life,” not a temporary fix. People who adopt long-term lifestyle changes are more likely to keep the weight off (and be happier!) than those tempted by a miserably restrictive diet. Try focusing on healthy eating without dieting, and aim for losing 1-2 pounds per week. One pound equals 3,500 calories, so the CDC recommends reducing your daily intake by about 500-1,000 calories. For more tips on eating healthy and losing weight, contact Wellworks For You today. What are some of the craziest diet tips you’ve ever heard? Let us know in the comments!